Description PathwaysWeb: An Open-Use Integrated API of Pathways, Genes, Directional Gene Interactions, and the Gene Ontology with Data Versioning for Provenance. A number of databases and application programming interfaces (APIs) exist for retrieving genomic and related data for use in biological research. The existing systems sometimes provide data that is incomplete, use different data identifiers and often do not keep their databases in sync with one another. Those incompatibilities can make the data difficult to use for research. Furthermore, the APIs and data formats may change often and without warning. Many systems have no API and require either the download of an entire database or parsing of web pages to access the data via an automated system. To help avoid some of the issues listed above, we have developed a resourced-based, well-documented web system, PathwaysWeb. 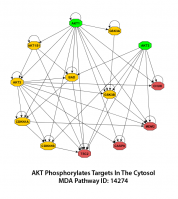 The system provides publicly available information on genes, biological pathways, Gene Ontology terms, gene gene interaction networks with interaction directionality, and links to related PubMed documents. To harmonize the data, it is based on sene symbols approved by the Human Gene Nomenclature Committee (HGNC). The system retrieves data from multiple sources and standardizes elements ensuring that gene symbols in pathways are consistent with HGNC names, and presents the combined data via an integrated web API. Each set of data loaded from the various sources is an archived version of data. The PathwaysWeb system contains multiple resources. The relationship between those resources can be seen in the diagram below. PathwaysBrowser, (documentation) an HTML view of the data that is searchable, provides a menu for shortcuts to the available resources, and online help. The download of the data from the various sources and processing of the data consists of multiple steps.